Unique Gift Ideas for Babies - 17 unique baby gifts you will love! Baby gifts can be some of the most fun gifts to buy, but how about out-of-the-ordinary finds, unique gift ideas for babies? It can be overwhelming how many toys and great buys there are when it comes to babies and children, so finding something that stands out is truly what makes the best gift! This list of toys and genius finds are perfect for babies of all ages! We have found 17 unique baby gifts you are going to love! It can be hard to know what to buy a baby, especially a baby that has older siblings, but hopefully you will find something fun and exciting within this list. Another fun gift idea for babies is to buy baby milestone and keepsake products so their parents can treasure how small they are forever! 1. Munchin Mozart Music Cube | This musical, light-up toy will help babies to recognize sounds and be able to entertain themselves for hours. It’s such a great toy that babies will learn from while they enjoy playing with it! 2. Bottle Holder | When you’re looking for a unique baby gift, this one easily makes the top of the list. The baby’s bottles and pacifiers will both always be in reach for them when they wear this, making it easier for the parents, especially when multitasking! It comes in a couple of colour options and also helps to promote independent feeding once they reach that age. 3. Baby Banana Tootbrushes | These banana toothbrushes are equal parts adorable and useful! They’re great to start to promote healthy habits early on with babies, but they’ll also feel great on babies’ gums once they start to teeth and they’ll love playing with them. 4. Nesting Wooden Blocks | These rainbow blocks will be especially fun once a baby begins to crawl around, grab toys and play with things! They nest within one another so they’re easy to store away. They are made of wood, making playing safely and happily very easy. The paint used is all-natural and free of toxins so there’s no worries for parents while their little ones play happily with these fun blocks. 5. All-in-One Plate & Placemat | Babies love to throw food and make messes while they eat, but with this unique gift for babies, they won’t be able to throw their plate to the ground as this suctions to any table or highchair. It’s easy to travel with and a great option to take to restaurants with as well! 6. Turtle Cool Calm Press | This adorable ice pack is soothing for babies when they’re teething and even right out of the freezer, it isn’t over powering or rock solid so they can get the ice cold benefits without it being too much for them to handle. They come in all sorts of fun shapes and animals! 7. Wooden Clutching Toy | This small, handheld sized clutching toy is perfect for babies to play with once they start reaching and grabbing for things. It’ll help with fine motor skills and is such a great baby toy for such an affordable price. 8. Animated Elephant Plush Toy | Isn’t this the cutest little elephant toy?! It’s soft and plush to the touch, it plays music and plays peek-a-boo; any little one will love playing along and laughing to the music with this elephant. 9. Light-Up Bath Toy | The easiest way to keep a baby occupied during bath time? Light up toys, of course! Once this bath toy is placed in the water it’ll light up, and turn off when removed from the water. 10. Plush Blooming Flower Baby Bath | This is the best alternative to your typical baby bath! It fits nearly every sink size and is the perfect option to bathe your baby in. It’s safe most importantly, and also makes bath time fun – no more hard, uncomfortable baby tubs. 11. VTech Lil’ Critters Ferris Wheel | This genius baby gift idea sits right on top a high chair or any other flat space and will keep babies busy for so long! It lights up, sings and dances and is sure to bring a smile and little giggle to their face. 12. Pop-Up Activity Toy | Once babies begin to sit up and crawl, this is a perfect gift idea. It allows them to explore, push buttons and play independently and have a great time doing so! 13. Magnetic Footie PJs | This may look like another adorable baby outfit, but it’s way more than that! Unlike your typical baby onesie that buttons or zips, this one closes extremely easily – with magnets! No more frustration for parents trying to zip and button clothes while baby squirms around and kicks their feet. It’s a genius baby gift and something so unique to gift. 14. Ride-On Push Car | This adorable little ride-on car also comes in pink and is great for parents too – they can take a walk and let their baby enjoy themselves thinking they’re driving at the same time! Once babies sit up, this is a perfect toy for them to enjoy. 15. White Noise Sound Machine & Night Light | This plush owl is perfect for babies to sleep with. It fits perfectly in or near their crib and plays 10 different songs. It provides just the right amount of light to sleep with and soothes them to sleep. 16. Teething Mitten | Babies can soothe their teething pain as much as they need it with this genius teething toy! It’s a small glove that they can wear that will relieve sore gums whenever they need it. No more frustration when their toy falls – this is one they can wear. 17. Activity Play Mat Rug | This activity mat serves both as a perfect spot for babies to play on and also a storage bag! You can create a perfect sized play space where ever and whenever – this is especially great for the beach, airport or any other place you’ll go to let babies play while being safe. 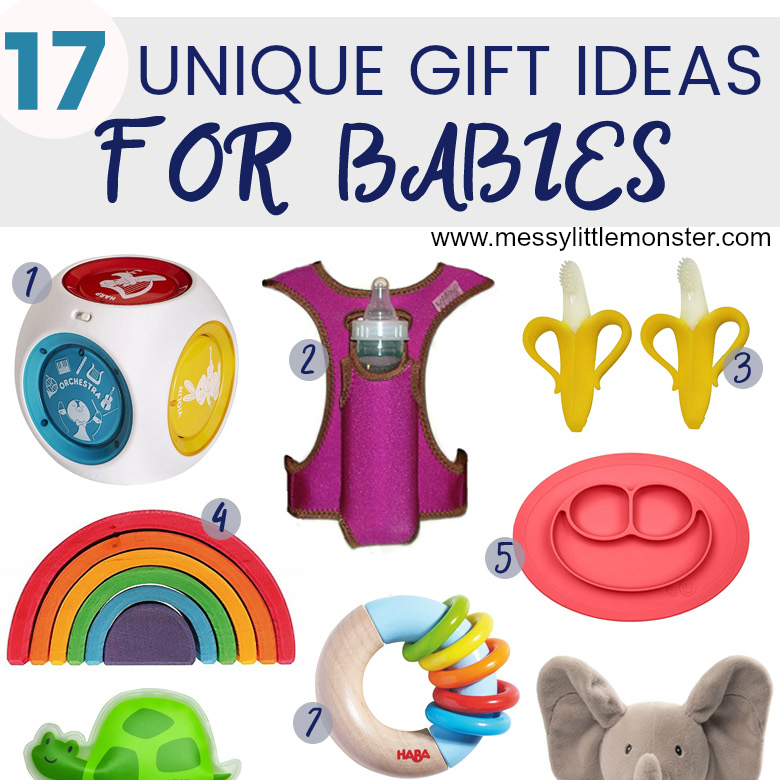 There you have it, the perfect list of unique gift ideas for babies. Hopefully one or more of these unique baby gifts appeals to you, but if you may find something in our list of stocking fillers for babies.